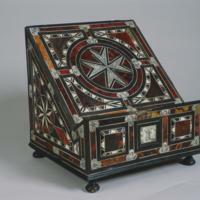 This stand, with its elaborate inlay, was originally intended to hold a missal or prayer book. Its bold decorative patterns—with dark brown tortoiseshell and black ebony set against white bone—represent an aesthetic prized in New Spain in the late 17th and early 18th centuries. While the stand is not itself a sacred object, it bears images associated with Catholicism, including symbols of the Dominican order. Dominican habits were black and white, and these colors were associated with their order, one explanation for the dramatic tonal contrast of this work. The variegated browns of the tortoiseshell inlay add to the dramatic visual effect, particularly when contrasted with the bone white panels. The ones at center have been engraved with the heads of winged cherubs while others on the stand display floral patterns. In the central eight-pointed cross, the IHS monogram at top refers to Jesus. To the right, “MR” stands for “Maria Regina” and, at the bottom, the name of Joseph, Jesus’s earthly father, appears. This part of the missal would support the spine of the book when it was opened for reading or prayer. It is likely this stand was commissioned by Dominican friars, perhaps for use in a church or monastery. Today, neither the specific workshop nor the original patron is now known. It is likely, however, that this work would have been produced by craftsmen associated with a guild of furniture and cabinet makers in Puebla de los Angeles, Mexico. This missal stand was probably created in a workshop in Puebla de los Angeles, Mexico, a city renowned for its marquetry (wood inlay). Made of wood, overlaid with tortoiseshell, bone, ebony and silver, the stand measures 12 1/2 x 10 1/4 inches (ca. 31.75 x 26 cm). In New Spain, tortoiseshell was abundant, and it made a choice material for mosaic-like inlays on chests, tables, elegant mirror frames, and, in this case, liturgical furniture. The small bone plaques also display engravings in fine black lines. The design work on display here owes its origins to numerous sources. The bold geometric patterning may have drawn indirectly from Islamic woodworking, which inspired both Spanish and Spanish American craftsmen. 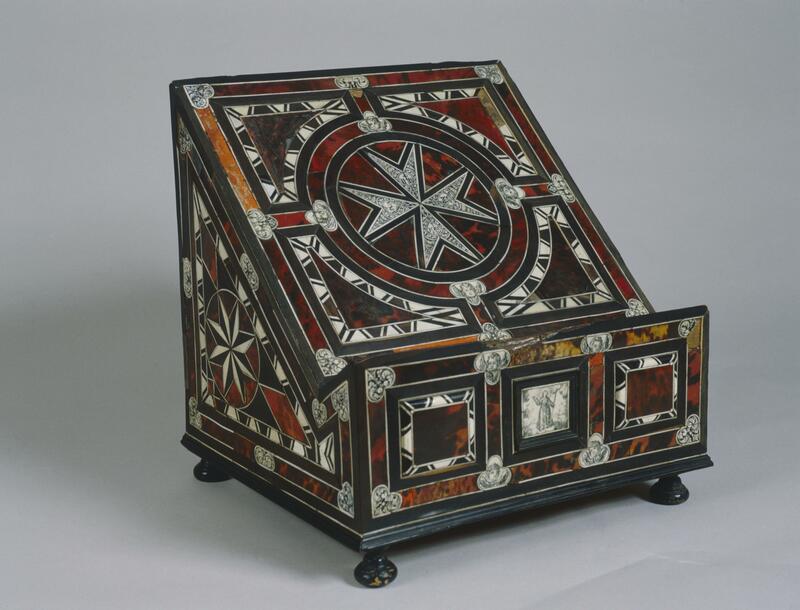 And furniture inlaid with inscribed bone, which may have originated in Italy, was popular across Europe. Objects such as this make it clear that aesthetic taste, no less than desires for luxury items, extended across the Atlantic to New Spain. While the craftsman (or craftsmen, since so many materials are involved) often could not afford to own Italian bone-inlay or Islamic fretwork themselves, their patrons may have shown them examples to offer both aesthetic inspirations and technical models. The Grandeur of Viceregal Mexico: Treasures from the Museo Franz Mayer/ La grandeza del México virreinal : tesoros del Museo Franz Mayer. 2002. Houston, Texas and Mexico City: Museum of Fine Arts, Houston and Museo Franz Mayer. Taracea: Islámica y Mudéjar. 2000. Mexico City: Museo Franz Mayer and Artes de México.